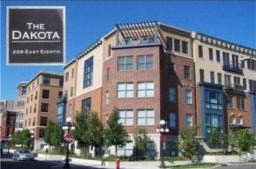 The Dakota on the Park condominiums were completed in 2003 as part of the Wacouta Commons project by the Lander Group. It is adjacent to Wacouta Commons Park and shares the courtyard with the nearby Sibley Court Apartments. There are a total of 37 townhomes & flats on four levels of the building. The association fee includes Cable TV, Hazard Insurance, Outside Maintenance, Professional Management, Sanitation and Snow/Lawn Care. It is located at the corner of Sibley and 8th street and the address is 209 8th Street East, Saint Paul, MN 55101.